Legumes have long been known for their nitrogen-fixing properties, the process by which nitrogen in the Earth's atmosphere is converted into ammonia or other molecules available to living organisms. Through a symbiotic relationship with rhizobia, legumes can provide their own nitrogen needs and leave nitrogen in the soil for other plants to use. Legumes allow the rhizobia to infect their roots, which leads to the formation of nodules where bacteria are accommodated to convert nitrogen from the air into ammonia that the plant can use for growth. This allows legumes to thrive in areas that have limited nitrogen. Nitrogen fixation also provides the benefit of leaving nitrogen behind in the soil after the legumes are harvested, which means less nitrogen fertilizer need for the next season's crop. This reduces the need for nitrogen fertilizers, which are costly and can cause environmental pollution. Also, the natural process is vital to the practice of crop rotation, which prevents soil exhaustion. But not all legumes are the same when it comes to fixing nitrogen. Legumes act differently in different environments and with different bacterial strains—legumes sometimes fix little to no nitrogen. Now, scientists have discovered a more efficient way for legumes to fix nitrogen that may prove more consistent. Two antimicrobial peptides in the legume Medicago truncatula that kill certain rhizobial bacteria as the nitrogen fixation process begins, discovered researchers with the University of Kentucky. The finding is important, says Yojana Jeevane, a BCC Research analyst. "Nitrogen is the most important limiting element for plant production and growth," she explains. "It plays a role in almost all plant metabolic processes because it is a constituent of amino acids, which are required to synthesize proteins and other related compounds. Not only that, it's required for nitrogen fixation, any natural or industrial process that causes free nitrogen, which is a relatively inert gas plentiful in air, to combine chemically with other elements to form more reactive nitrogen compounds." 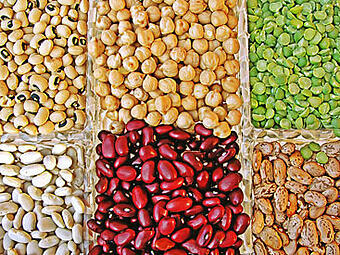 Legumes are a large and diverse family of plants that include a number of important crop species. As noted by bmcgenomics.com, M. truncatula, which is closely to alfalfa, is a model for studying nitrogen fixation, symbiosis, and legume genomics. Bacteria that do not tolerate the peptides die almost immediately. Zhu believes the original function of these antibacterial genes was to kill bacteria as they entered the plant, but they have evolved to manipulate certain bacteria to start the nitrogen fixation process. Research findings were published in the Proceedings of the National Academy of Sciences. Jeevane estimates the global agrochemical market to reach $266.0 billion by 2021 from $213.2 billion in 2016 at a compound annual growth rate (CAGR) of 4.5%, from 2016 to 2021.